Youth gather at Hart Plaza to go out to serve. I just spent a week in Detroit with 30,000 of the most energetic young people I have ever known. 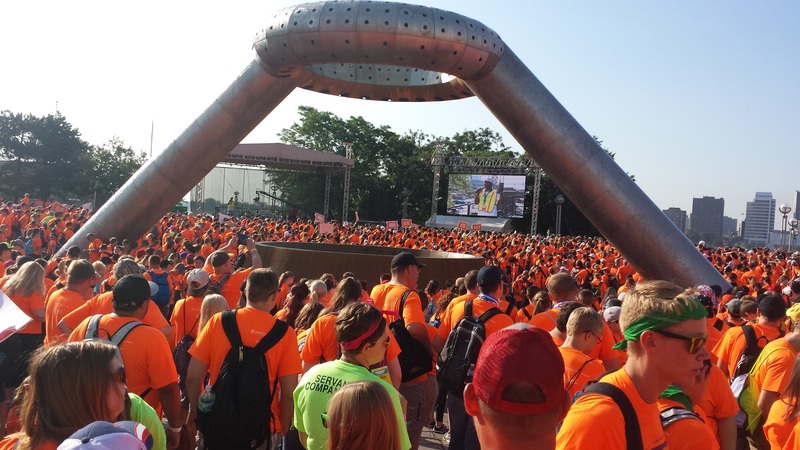 This was the Evangelical Lutheran Church in America’s (ELCA) national Youth Gathering, held every three years in various cities around the United States. Let me say at the outset that the choice of Detroit was a controversial one. As early as last November parents expressed their concern that Detroit was not a safe city and they would not risk sending their children. It took a lot of convincing on the part of the ELCA and our Synod coordinators that their youngsters would be well cared for. 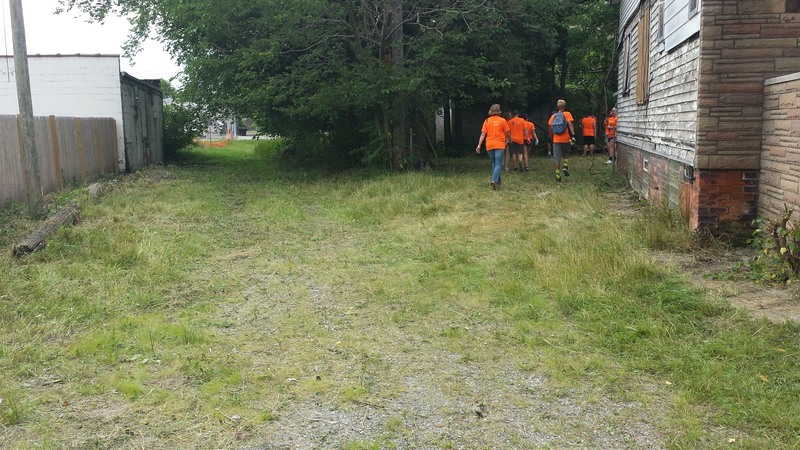 In the end, nearly 600 youth from Northeastern Ohio congregations made the trek to Detroit for the thrilling and life-giving experience. 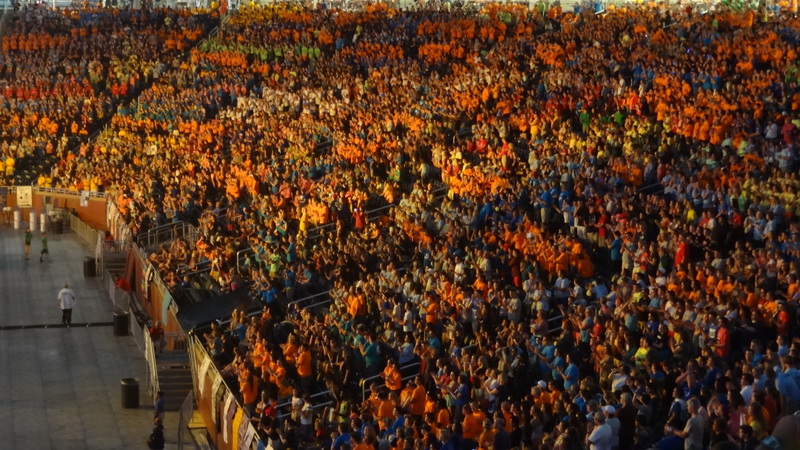 A portion of the evening gathering at Ford Field. Gathered under the theme “Rise Up Together,” these young people worshipped, studied scripture, spent time doing service projects in the neighborhoods of the city, heard from dynamic speakers, were entertained, and enjoyed each other’s company and fellowship over the course of the five days. The energy level was immense, to say the least. But most importantly, their presence in the city gave a powerful witness that transformed the people who came into contact with them. As one media report mentioned: They seem to have opened eyes and minds in the city where they prayed and praised, painted and landscaped, and heard Motown legends as well as Christian rockers named Skillet. The many outreach ministries they did brought glory to God. I spent several hours on Saturday with the youth from Prince of Peace Lutheran Church of Westlake in Detroit’s Osborn neighborhood. Osborn was once a thriving, middle-class community, sustained in large part by the booming automobile industry. Then the auto manufacturing jobs moved elsewhere, leaving in its wake, the discarded homes that people could no longer afford, dilapidated by years of neglect. 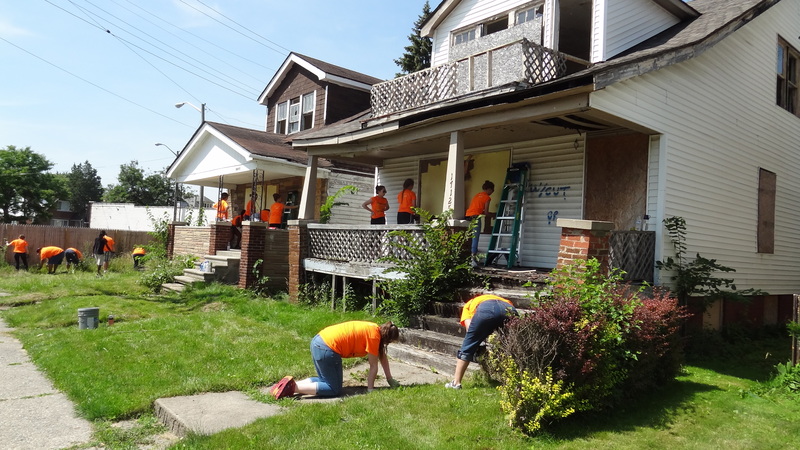 Our assignment was to clean up the yards of two such abandoned houses. 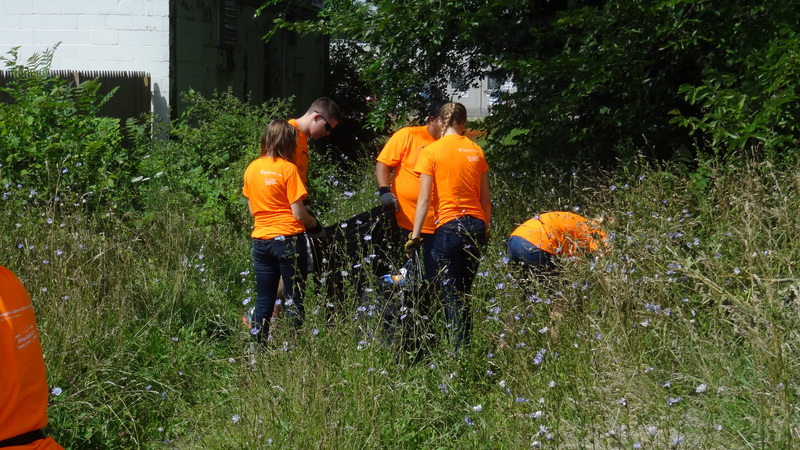 Along with other groups from Alaska, California, Illinois and New Jersey, they dove into the overgrown grass and weeds and left it in pristine condition by the day’s end. A couple of Detroit police cruisers drove by and the officers were so impressed by the job, they asked if we could cut down the shrubs across the street as well. It was a gesture not only of good will, but a show of the service to which Jesus calls us. And it is through that service that we go out before others and proclaim God’s mercy and grace. The mission statement that we heard repeated throughout the week was: Bearing Burdens, Building Bridges, Breaking Chains, and Bringing Hope. The same yard after the cleanup. And it was that last point that most inspired me. I am full of hope for the youth of our church. I am convinced that our church is in good hands. There is a lesson here for us adults to learn as well. As adults, we are sometimes unable and often unwilling to give up control. When we agonize about why the youngsters are leaving church, we need to look at ourselves and ask, what opportunities are we giving them to offer their boundless energy and enthusiasm, their passion for the gospel? God’s invasion of this world in Jesus is resisted by those who hold power, those whose lives are dedicated to keeping boundaries intact. The challenge is to avoid the temptation of refusing to let go of our sense of authority and denying youth of their willingness to serve. Watch the slide show below. Listen to the stories these youngsters will share over the coming days and weeks. Allow them the opportunity to put their faith into action in your setting. Detroit did, and today, the city and the world have seen the wonders of God’s glory. I’m thankful that the girls have many opportunities for service in their active youth group at home. I hope the spiritual “high” is sustained, but, you hit the nail on the head (as usual) our church will be in good hands. Thanks for your words, Donna. I am looking for ways to involve more youth on the Synodical level. Wow!! is what I said for this is really very inspirational!! Thanks for sharing this one!! God bless you!! Thanks for your kind words, Alicia! I really am going to make an effort to visit you soon.